What is it with the explosion of interest in Greenland paddling (GP) in recent years? Who even knew that you could make a standard kayak ‘go’ with what is essentially a whittled down 2×4? For centuries now, the people of Greenland have paddled with “sticks”, and make it look soooo goooood! (You remember the people of Greenland – they inventing kayaking.) It is only more recently that European and subsidiary civilizations have realized the benefits of GP. As you dip the long thin shape of a GP blade into the water the force increases gradually. With a euro-paddle blade full-immersion is more sudden and so is the force felt by your shoulders, arms and wrists. This sudden force is good for racing but puts more strain and shock on joints, muscles and ligaments. The blades on a GP are never feathered, so your wrists stay straight, in their strongest position, throughout the stroke. Wrists are a weaker joint, so care is called for. The loom (shaft) of a GP is rectangular or oval so a strong grip is not necessary, saving your wrists and forearms from fatigue. And, the loom is shaped so the canted GL stroke happens naturally, also avoiding wrist fatigue. The shape of the GP blade allows you to paddle at a higher cadence (# of strokes per minute). A higher cadence uses your body’s power more efficiently – like of using the smaller gear on your bicycle. Your wooden GP will have more flex during a stroke than a fibreglass or carbon paddle. That flex is easier on those joints, muscles and ligaments! At the end of your GP stroke the blade pops to the surface, making the exit nearly effortless. The buoyancy of the wood and shape of the blade cause the easy exit. The narrow blades are sized so you can grasp near the end of the paddle. Some strokes are simply more efficient with such a long lever. The narrow blades cut through the wind easily. Say good-bye to grunting into the wind with your old euro-paddle. Those Greenland Paddles are decidedly easier on the body, and that’s the key reason for the growing interest in GP paddling. But beware, the tried and true strokes we learned for our euro-paddles are done differently when using a GP! If someone picks up a GP and tries using it like a euro-paddle – it doesn’t work well and they might give up GP right then and there. It would be sad to give up all the benefits! The smart way is to take a lesson where you will learn how to use that ingeniously simple paddle properly and thus receive all its benefits. The other reason for the sudden growth of GP is its connection to the ancient past of paddling. 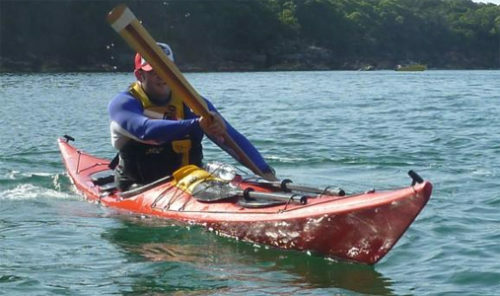 It is just nice to kayak the same way that our “forekayakers” did, using paddles similar to those used centuries ago. A great way to dive into the deep-end of traditional paddling is to build your own GP! It’s not hard with guidance and the right tools! At Undercurrents, we have GL experts who can answer your questions and get you on the water. Swing by and chat – we are here to help! Next post: It’s time to WINTERIZE your kayak!